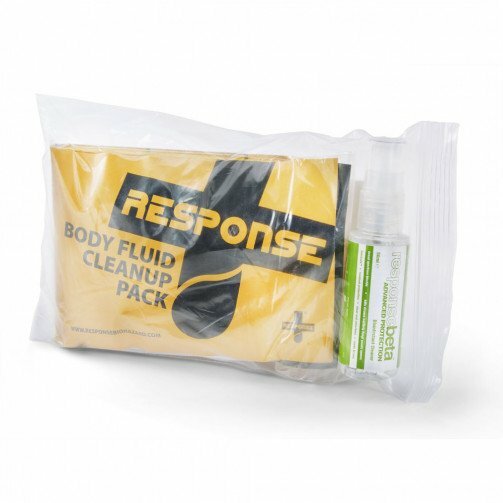 Body fluid spill cleanup kit. 2 Applications. Our Body Fluid Spill kits is designed to enable any worker to deal with the problems of body fluids such as blood and vomit. These kits are easy to use and address all the issues that are caused by cross contamination and infections caused by Bio Hazards. The HSE guidance on 'Blood - borne viruses in the workplace' (leaflet INDG342) and there is a provision under COSHH that employers have a legal duty to assess the risk of cross infection for employees and others affected by your work. Q. Please can you tell me the ingredients for the absorbant powder which is part of the spill refill kit? A. The ingredients are listed in the safety data sheet, please click on the link to view this. Q. How are the SPILL2 packaged? A. The spill kits are packaged in a clear reseal pouch with another clear pouch inside containing the granules.